Secrets fly amid the heated aquamarine pools, manicured lawns and Range Rovers in the luxurious town of Rosewood, Pennsylvania. Behind their oversized Gucci glasses, beneath their perfectly ironed blazers, everyone has something to hide. Particularly, Aria, Spencer, Emily and Hanna. Each girl has an atrocious secret that they will do anything to cover. Emily likes the new girl in town, a little more than a friend should. Spencer’s sister Melissa has a gorgeous new boyfriend, the only problem is that Spencer likes him too. Aria has a new crush, who also happens to be her AP english teacher. 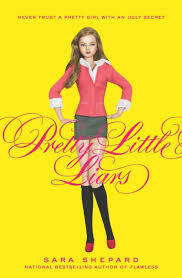 And Hanna will do anything to be perfect and popular, even something dangerous. All of their secrets are buried deep in only their hearts, and Ali’s. Their friend, Alison DiLaurentis, the girl that all girls wanted to be, and all boys wanted to date, knew all of their deepest, darkest secrets. Every time they hung out with her, she dangled the things that she knew about them over their heads. But now, Ali is dead, and their pretty little secrets are buried in her grave. Yet a person who calls themselves A is threatening and stalking the girls. The scary part is that A knows all of their scandalous secrets: the secrets that only Ali, their best friend knew. Who is A? What does A want? Sara Shepard has written an incredible story with a remarkably twisted plot, about four girls that live in a town that is thought to be perfect, but has a very dark past, just like its residents. This book is the first in the series, and once you start it, you will have to finish. Each of the girls’ experiences add together to create a romantic, scary and unreliable setting. No one can be trusted. Sara Shepard has a suspenseful and relatable way of writing, that feels realistic and applies to the drama and problems of present day life. The characters are portrayed so authentically that they could be actual people. Shepard also makes you feel like you are one of the characters in the story. As Spencer, Hanna, Emily and Aria live through their everyday lives, being threatened by A, you can feel your heart hammering when Hanna “borrows” her boyfriend’s Mercedes and crashes into a tree and when Spencer is caught doing something that she shouldn’t be doing. If you liked The Lying Game series or The Clique this book is a must-read for you.